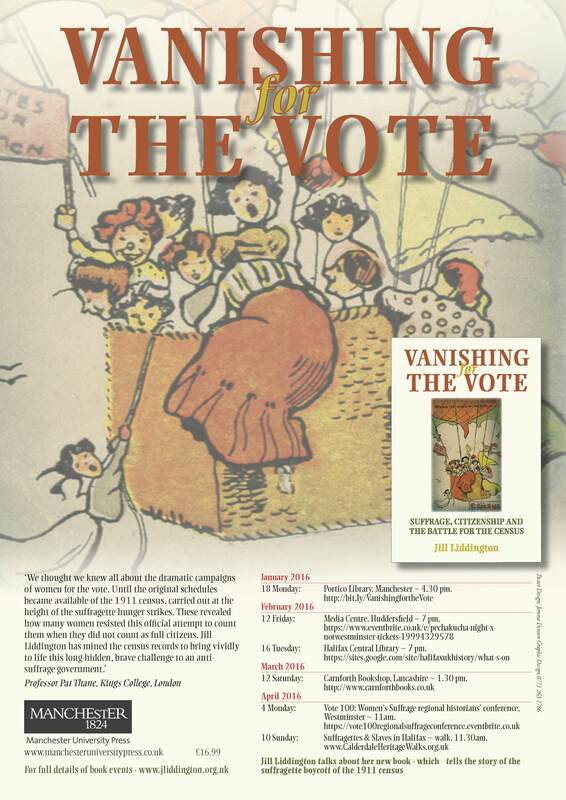 Jill Liddington, author of Vanishing for the Vote, has a number of book events coming up. Please see the below poster for more details. Vanishing for the vote recounts what happened on one night, Sunday 2 April, 1911, when the Liberal government demanded every household comply with its census requirements. Suffragette organisations urged women, all still voteless, to boycott this census. Many did. Some wrote ‘Votes for Women’ boldly across their schedules. Others hid in darkened houses or, in the case of Emily Wilding Davison, in a cupboard within the Houses of Parliament. Yet many did not. Even some suffragettes who might be expected to boycott decided to comply – and completed a perfectly accurate schedule. Why? Vanishing for the vote explores the ‘battle for the census’ arguments that raged across Edwardian England in spring 1911. It investigates why some committed campaigners decided against civil disobedience tactics, instead opting to provide the government with accurate data for its health and welfare reforms. This book plunges the reader into the turbulent world of Edwardian politics, so vividly recorded on census night 1911. Based on a wealth of brand-new documentary evidence, it offers compelling reading for history scholars and general readers alike. Sumptuously produced, with 50 illustrations and an invaluable Gazetteer of suffrage campaigners. Category: Blog, Cultural Studies, Events, History	25 Comments.